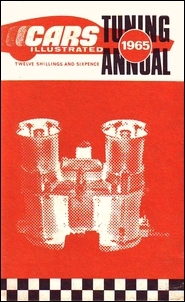 This article was first published as a chapter in the book Cars Illustrated – 1965 Tuning Annual. 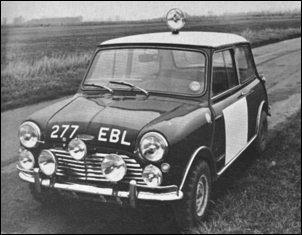 The author is the famed rally driver Paddy Hopkirk, best known for his giant-killing performances in the Mini Cooper S, including wining the 1964 Monte Carlo Rally. The material has historical interest (eg the idea of sleeping in a fast-moving rally car!) but also has plenty of points that remain relevant today for any driver of fast cars (like ‘crossing’ the beams of auxiliary lights to better see around corners). 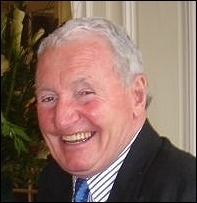 The text is used with the permission of Paddy Hopkirk. All other things being equal, there is no doubt at all that good preparation wins more rallies than any other single factor. This means a lot more than simply tuning the engine: personally, I think that private owners spend too much time on preparing the engines, and I have seen private owners with cars that are actually faster than the works ones, but they pay far too little attention to detail. Things like wiring and exhaust pipe brackets - you can lose a lot of time if the exhaust system, which is always pretty vulnerable, falls off - and the brake pipes and the battery lead, for instance, which can be protected by running them inside the car. Another clever thing I've seen B.M.C. use on their works rally cars is a coil spring round the brake pipes at the front to stop stones damaging the flexible pipe. Interior comfort is impor­tant, too: four days and nights is a long time to spend in a car, and when this is taken into account with the tight schedules of an international rally, it isn't surprising that a lot of crew efficiency can be lost if they aren't comfortable. We are getting ahead of ourselves here, though. Let's start at the beginning. Some people might say that the most sensible modifications to put on a car include fold-down seats, a detachable gear-lever and a girl that's willing, but seeing that it's rallies we're talking about and not other forms of motoring sport, I'd better be serious. The first thing I would do to a standard car is to change the brake linings for anti-fade types - before I touched anything else. 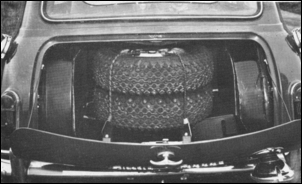 Then I would fit tubed tyres - but not tubes in tubeless tyres: many people do that but it is completely wrong, because you can get air trapped between the tube and the tyre which can have dangerous effects. Next on my list would be the light - good lights are essential on a rally car. I am not keen on cadmium bulbs - their advantage is a myth where fog is concerned. All yellow bulbs do is to cut down the intensity of light, so that you think you can see better simply because the light is not so bright. Far preferable are the iodine vapour bulbs - for everything. I would change the sealed beam units, too, on the headlamps. These are fine for ordinary motoring, but on rallies they have one big disadvantage - if a stone breaks the glass the light goes out altogether, but with separate bulbs there is at least a chance that it won't be damaged, and you can still see where you are going. Then I would add a couple of fog lamps - not driving lamps - which should be mounted so that the beams are crossed. In other words, angle them so that the left-hand lamp shines across to the right of the road, and vice versa. These have other uses than merely as aids in fog: with iodine vapour bulbs, which are single filament types, you have to arrange the wiring so that the fog lamps can be used as the 'dipped' beam. A reversing lamp is essential, and you need an extra spot lamp on the front, mounted as high as possible, so that it is useful for switchback roads. With this arrangement you will be able to see as well as anyone, and the angled mounting of the fog lamps will even let you see round corners up to a point. I wouldn't bother with a [steerable] roof lamp unless I had a particular event in mind. It means drilling a hole in the roof of the car, which doesn't help when you come to sell it, and although I found it useful on the R.A.C., I don't think I ever used it on the Monte. Of course, if you have a lot of sign­post spotting to do, one of those windscreen-mounted swivelling lamps is useful and doesn't mean boring holes in the bodywork. The time is going to come when you have all these lights on at once, or at least most of them, together with, perhaps the screen wipers and the navigator's light. So the fitting of a competition regulator and a high-output dynamo is obviously essential, or you will end up with a flat battery - and that won't help you win anything. I've spent a lot of time talking about the electrics, but this is an extremely important part of the preparation, and with the em­phasis on night rallying you can easily see why. So, to go on from where we left off, the ignition system must be effectively water-proofed - this applies especially to Minis. You can do this with a silicone compound grease or with a rubber cover: plastic bags are not very good for the job because of the likelihood of getting con­densation inside. Then, on Minis, you want a blanking-plate in front of the distributor, and waterproof plug covers. You want lots of power low down, and I don't think you can have too much of it. Some people have said that too much power gives wheelspin, but to me it is really a question of a good driver using the power properly. There are always places on any event where extra power can be used to advantage, whether it is an international event or a small club rally where you can make up some time with a quick ten miles on the M 1. The works teams certainly look at it this way: tuning a works rally car naturally depends to some extent on the event, but I think generally that we have proved now that a racing engine is the best, even in the Alps. Obviously, when you are tuning the engine you want to sacrifice as little reliability as possible - even if it means stripping the engine down after each event to check for wear and defects, as they do on racing cars. I am often asked about the best car for the job. I may be prejudiced, but I honestly think that, without doubt, the Mini-Cooper is the best all-round club car. It can win rallies and driving tests, and it is quite amusing to race. I like front-wheel drive. I think it is much more forgiving, and, let's be honest, we all make mistakes sometimes. For pure racing the Cortina is pretty good, and it is a good rally car, too, but if driving tests are involved it is at a disadvantage over the little Min. Well, that's what I think about the car, and the work I think needs to be done on it for rallying. But we haven't finished yet: there's the interior to be sorted out. Personally, I like all the instrument bezels, the dashboard and even the roof lining to be matt black—in fact, I think that that should be standard on all cars, as it is on aircraft. Odd reflections all over the place can be very dangerous. I think you must have a headlamp flasher, and good wind­screen washers and two-speed wipers are obviously useful. Personally, I like a leather-covered steering wheel - I definitely all do not like wood-rimmed ones, which can splinter in a crash and can cause some nasty injuries. 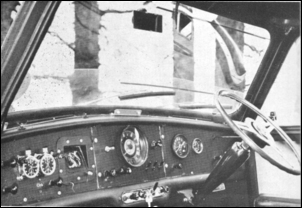 A horn operated by the co-driver is useful, and safety belts, of course - I wear one all the time. An electrically-heated windscreen is better than relying on the ordinary de-mister. So far as instruments are concerned, I have a rev-counter - the more highly-tuned your engine, the more the important this is - an oil-pressure gauge and a water temperature gauge - the capillary type, not the electrical ones. I think they are more reliable and more accurate. I don't like an ammeter as a rule - it is something else to go wrong, and anyway you don't a really need it if you can have faith in the way you have prepared the electrics. On a Mini I like to have extensions on all the switches. The instrument lights want a dimmer on them - I like very much the little aircraft-type 'pillar' lights. My favourite seats are the Microcell ones, with a fold-down type for the navigator. On long-distance rallies endurance is a bit of a problem. In our car the co-driver does a lot of the driving in the early stages, although the number one driver does all the special stages and, usually, he sleeps when I'm driving, and vice versa. It's very difficult to get proper refreshing sleep in a fast-moving rally car, but it is very important that you should be alert when you're awake. I like a proper pillow, as well as a head-rest, and a sleeping bag, so that I can snuggle down inside with my shoes off. At any rate, that's what suits me best. Things occasionally go wrong, even in the best-regulated circles, and it is tempting providence to set off on a long rally without some spares and proper tools. We usually have spare plugs, a roll of insulation tape, a big roll of paper tape and some electric wire and copper wire. Spare wheel nuts are important - I always have one or two in my pocket on a rally, in case I drop one when we're changing a wheel. We carry a spare distributor cap, all ready wired, because there is no time to fiddle about with H.T. leads. Spare speedometer and throttle cables, a complete contact-breaker and con­denser set and spare bulbs for all the lights, a couple of spare throttle return springs and a bag of assorted nuts and bolts are included, and we always have a first-aid kit. One of those combined compressed air bottles and fire extinguishers which put out fires and blow up tyres very quickly are something I am very keen on, and, of course, if the worst happens and you go off the road a tow-rope is a handy thing to have - our rally cars always have proper attachment points for the rope welded on to the chassis - and a spare inner tube, even if you are carrying more than one spare wheel. A useful tip is to taper both ends of the wheel nuts, so that if you replace them the wrong way round when you change a wheel in a hurry, it doesn't matter. For really long-distance events, especially those abroad, it is safer to carry spare fuel, and for this I like those petrol 'bags' which are now on the market. When they are empty they take up very little room. I would like to finish by giving a bit of advice about the events themselves. In my opinion, a private entrant would be better off forgetting about club rallies if he is at all serious about the sport. He will never learn anything there, and would be better off saving the money- and even club rallies can be very expensive if you do them seriously - and doing one international. On the little narrow roads you find on club events you never learn anything about 'setting-up' the car, whereas a wider road - and inter­national events include a lot of main-road work - gives you more room to manoeuvre. Even in the Alps you've got room to slide the car, but you can't do that in the Welsh mountains. Club rallying is an excellent form of the sport, and I have a lot of respect for it, but it is completely different from international rallying. Obviously, every driver has to start there, but it is not where the modern team manager looks for his new drivers. Really and truly, racing is a better training ground, although even experienced racing drivers don't generally seem to do too well in rallies. I think this is because in racing there is never anything in reserve. You use your practice to learn the circuit until you know it exactly, and then in the race every corner is taken at ten-tenths. In a rally, you never know just what is round the corner and so you learn to hold back a bit: if you don't, then you'll go off the road sooner or later. So, to me, the answer for a driver who wants to go in for serious rallying with a works drive at the end of it is to learn the business in club rallies, get some racing experience, preferably with the same sort of car, and then have a real go at some internationals. Good luck, and good rallying!